How adorable are these?! 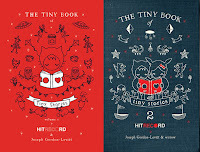 Born of an internet collaboration under the nurturing hands and minds of Joseph Gordon-Levitt and mysterious cohort "wirrow", The Tiny Book of Tiny Stories Volumes 1 and 2 are a product of Gordon-Levitt's HitRECord production company. Initially self published in 2010, !tBooks - which focuses on celebrity authors and picked up the cutsie collection - released Volume 1 just in time for it to make its way into everyone's Christmas stockings last year and dropped Volume 2 this past November. True to their title, these books, which are about the size of my hand from palm to fingers, contain super-short, super-smart illustrated flash fiction. 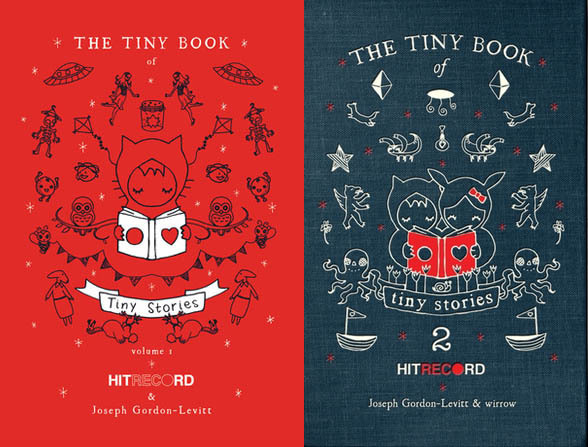 According to HitRECord, it doesn't matter which came first , people from around the world were encouraged to upload stories and illustrations - sometimes a story was submitted for a specific illustration, sometimes an illustration was submitted for a particular story. And out of a total of 23,515 submissions, 129 tiny stories married themselves so perfectly that they made their way into the two collections. As with any collection, large or small, some of the illustrated stories spoke to me louder than others. Among my favorites? "Ok, I'll admit, I have a few skeletons in my closet; but they weren't skeletons when I put them in there." "I collect flickering stars in old pickle jars, poking holes in the lid so they can breathe." "I know other worlds exist. I can see them in my peripheral vision." "If I read our story backwards, it's about how I un-broke your heart, and they we were happy until one day, you forgot about me forever." "Your kisses are like snowflakes: each one is unique. They land on me, before they melt away and leave me cold." "I just need some time away to remember why I stay". "You have reached the edge of the world. Please stand behind the barrier and take no photos." "As my story came to a close I realized that I was the villain all along." "No one was even aware of its existence, but when it sounded out we all knew..."
"Your heart has a little empty corner. You won't even know I'm there - I'll be very quiet." 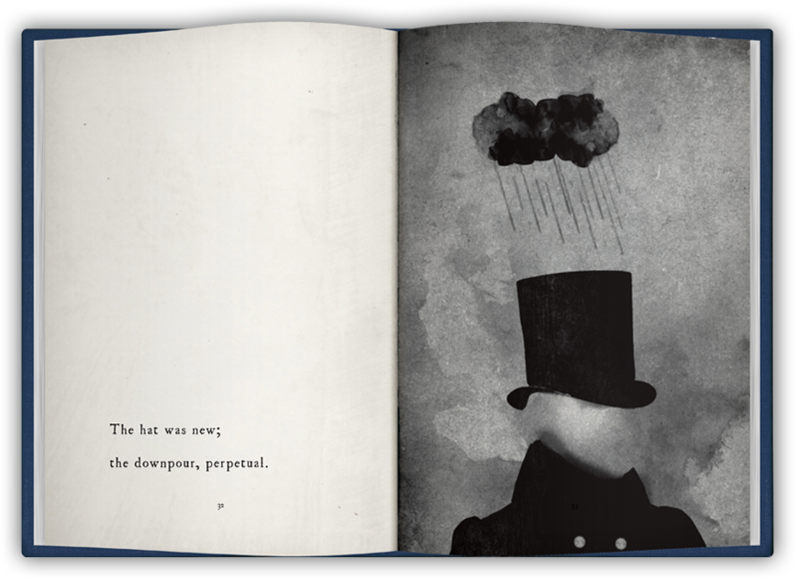 The magic of the Tiny Stories volumes is the tender and moody atmospheres the drawings and words create as they come crashing together on the page. The blushing cheeks of the little emo-boy, the violent red of the wolf's severed head against the grey and black background, you really have to see the way the words and the pictures compliment each other on the page. Click here to sample volume 2. A book, a miniature work of art, a thing to have and hold.